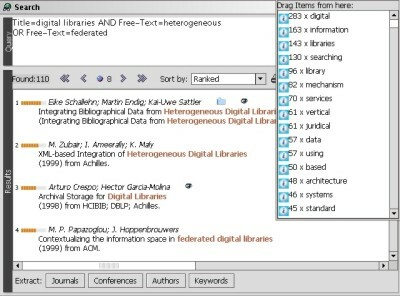 DAFFODIL is a search system for digital libraries aiming at strategic support during the information search process. From a user point of view this strategic support is mainly implemented by high-level search functions, so-called stratagems, which provide functionality beyond today's digital libraries. Through the tight integration of stratagems and with the federation of heterogeneous digital libraries, DAFFODIL reaches high effects of synergy for information and services. These effects provide high-quality metadata for the searcher through an intuitively controllable user interface. The implementation of stratagems follows a tool-based model. In many scientific communities a large number of digital libraries is available for online research. These federated libraries are by nature highly heterogeneous with regard to functionality, query language, and user interface, thereby requiring systems that provide a unified way of accessing them. However, while a unified access to the federated libraries is clearly needed, for many real applications a richer, a more powerful set of high-level search functions is necessary to support searching in an effective way [Fuhr et al. 2000]. DAFFODIL (Distributed Agents for User-Friendly Access of Digital Libraries) is a system for integrated search within the heterogeneous digital libraries of a scientific community, with merging of results. At this time, a prototype for the area of Computer Science exists that allows searching within more than ten different digital libraries and other sources of information. The available high-level search functions, implemented in a number of integrated tools, provide users with strategic support [Fuhr et al. 2002]. DAFFODIL combines browsing and searching strategies in a natural way. The system supports collaborative search and provides the user with awareness, i.e., it provides information of new or changed objects related to previous searches. Users are free in choosing a search strategy, but the system assists them by providing easy access to well-known search tactics or stratagems, and in helping them to combine these for creating a comprehensive search plan. Based on empirical observations of the information seeking behaviour of experienced library users, Bates [Bates 1979a,Bates 1979b] identified a number of successful tactics for the information search. In [Bates 1990] tactics referring to monitoring, file structure, search formulation, term selection, and ideas are described. The list of tools in this and the following section is not exhaustive but concentrates on the most important services providing higher search functionalities. The desktop of DAFFODIL is designed for extensibility and new tools can easily be integrated into the system. The search tool may be the most commonly used of the possible starting points for searching within DAFFODIL. It provides a form-based interface for formulating queries to the federated digital libraries in a uniform way, and allows specification of the search domain by selecting some or all of the available libraries. Wrappers map the uniform queries onto the query languages of the information providers. Results are merged and presented to the user (along with a paraphrase of the submitted query) in a homogeneous way for viewing and navigation. Unintrusive icons are used to mark documents that have previously been seen, stored or that have been interacted with in other ways (as seen in fig. 1). On the list of results, term extraction can be used to get commonly occurring terms, authors, journal or conference titles. Figure 1: Result view of the search tool and the term extraction. Queries, results, fulltexts, terms, authors, conferences or journals can be stored in the personal library, where they are saved for accessing them beyond the context of the current search. With personal folders users can structure their results, and can build a personal archive of interesting documents and other objects. For using search results outside of the DAFFODIL system, export functions are available. Group folders with the possibility for annotations on objects, including previous annotations, provide support for collaborative search. Based on the personal folders of a user, the system provides awareness and recommendations. 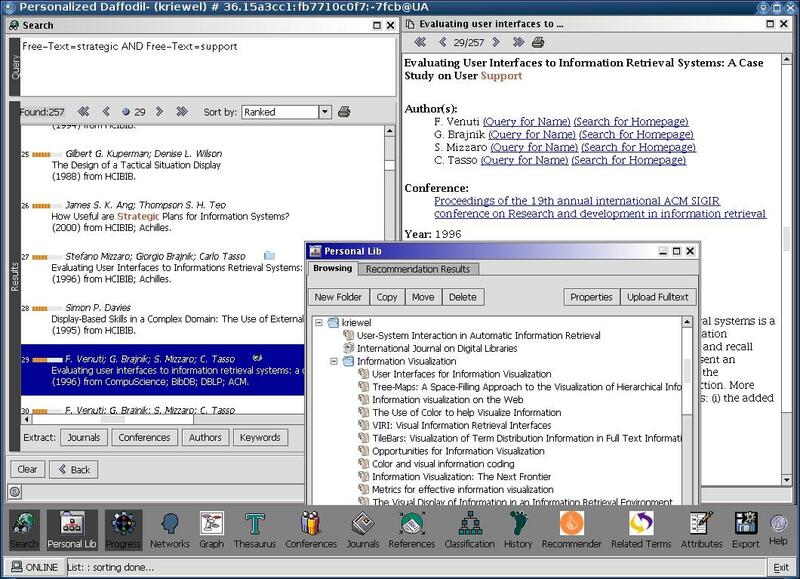 Figure 2: The DAFFODIL desktop: result list (left), personal library (center), and detail view of a document. A number of tools provide active support during the search, e.g., for the formulation of queries. They provide tactical help for improving a query with the goal of getting more hits or more exact hits. The 'Did you mean?' tool analyses the search terms used in a query, and suggests alternative (or corrected) spellings. Other tools find synonyms or related terms for a given query, where related terms means those terms that often appear in the same context within documents as the search terms. Finally, a tool for names of authors suggests possible completions for incompletely specified names, e.g., names that are missing a first name. Tactics are understood to be one or a small number of basic search moves combined into a single search operation: e.g., the steps necessary to broaden or narrow a query, or the generalization of a search term. Stratagems are a complex set of actions composed of basic moves and tactics that exploit the information structure of a single search domain. Strategy we call a complete plan for executing an entire search. Strategies are usually composed of a number of basic moves, tactics, and stratagems. DAFFODIL focuses on the stratagem level and provides users with strategic support during the information search process. The aim is to enable users to use complex search strategies with relative ease. For visualising the strategic support, an object-oriented tool-based model is used. On the desktop of DAFFODIL, the set of available stratagems is represented as a set of tools, that can be invoked in several ways, e.g., by dragging a digital library object onto it. With the reference tool (fig. 3) it is possible to find referencing or referenced documents for an existing document. The tool can be activated intuitively by dragging and dropping a document from other tools. The results can be reused to find more references, used within another tool for further searches, or they can be stored in the personal library. 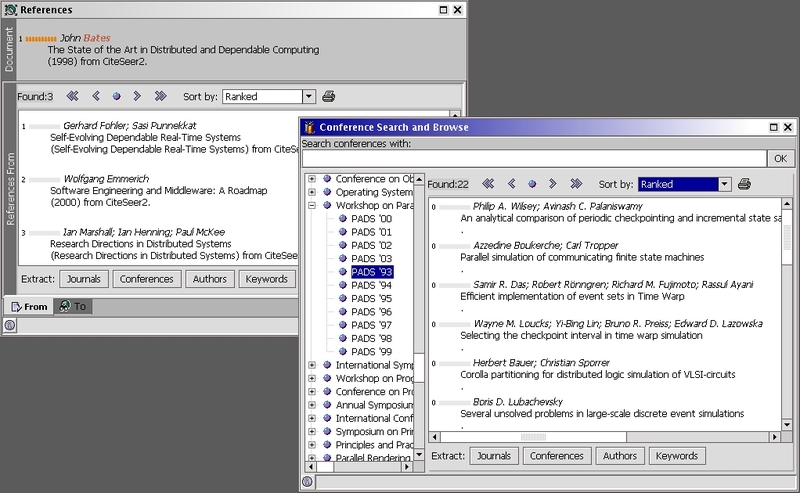 Figure 3: Reference tool (left) and conference browser (right). For browsing and searching in journal volumes and conference proceedings, the journal and conference tools (fig. 3) are available. Users can search for titles of scientific journals or conferences to browse within the resultsoften with direct access to metadata on articles or even links to fulltexts. These browsers can be used as a starting point or an intermediary step in a larger search plan. Explicit links in the detail views of search results point to the journal or conference proceeding where a document was published. Activating them will open the respective tool at the corresponding journal or proceedings. Another stratagem directly supported by DAFFODIL is the author search. Starting from an author whose relevance to the search interest is known, it is possible to search for further publications by this author, or to exploit the co-author relationships of the author for deriving a collaboration network [Fuhr et al. 2002]. 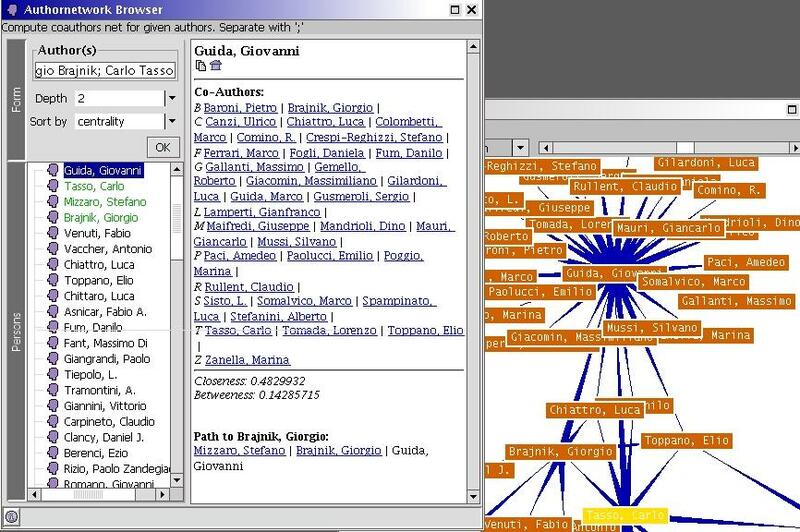 Figure 4: Author networks: browser and visualisation. In such a network which can also be visualised in a relationship graph (fig. 4) it is easy to identify central authors and to find authors who often publish together. Since the authors are ranked by centrality, the user may also find that other authors than the original one are more central to the search topic, and can use these for further searches. 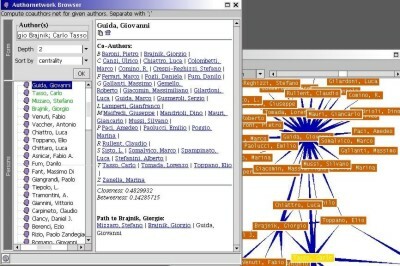 The classification tool provides users with access to a hierarchical, topic oriented representation of the search domain. It allows the browsing of classification schemes like the ACM Computing Classification System. The thesaurus tool can be used to get more general or more specific terms (hypernyms or hyponyms), or semantic definitions for a search term. Subject specific and web-based thesauri are used for finding related terms. The resulting terms can then easily be used in other tools for further queries. A three phase, qualitative evaluation [Klas et al. 2004] with 28 participants of differing search experience supported the underlying model and fulfilled the expectations in the system. Due to the tight integration of high-level search functionalities through the graphical tools, DAFFODIL makes efficient and effective searching possible. The concept of strategic support is realized at all levels of the system; the personal library supports personalization and group work. A user is enabled by DAFFODIL to apply complex search strategies in a natural manner. The presentation of search results by DAFFODIL eases the cognitive load of interpreting the information. The development of DAFFODIL continues. Currently, major areas of work include strategic support, pro-active help and awareness. DAFFODIL is used successfully at the Institute of Informatics and Interactive Systems at the University of Duisburg-Essen in Germany. The prototype is freely available at http://www.daffodil.de. The development of DAFFODIL was funded by the German Science Foundation (DFG) as part of the research initiative "Distributed Processing and Delivery of Digital Documents". [Bates 1979a] Marcia J. Bates. Idea tactics. Journal of the American Society for Information Science, 30(5):280-289, 1979. [Bates 1979b] Marcia J. Bates. Information search tactics. Journal of the American Society for Information Science, 30(4):205-214, 1979. [Bates 1990] Marcia J. Bates. Where should the person stop and the information search interface start? Information Processing and Management, 26(5):575-591, 1990. [Fuhr et al. 2000] Norbert Fuhr, Norbert Gövert, and Claus-Peter Klas. An agent-based architecture for supporting high-level search activities in federated digital libraries. In Proceedings 3rd International Conference of Asian Digital Library, pages 247-254, Taejon, Korea, 2000. KAIST. [Fuhr et al. 2002] Norbert Fuhr, Claus-Peter Klas, André Schaefer, and Peter Mutschke. Daffodil: An integrated desktop for supporting high-level search activities in federated digital libraries. In Research and Advanced Technology for Digital Libraries. 6th European Conference, ECDL 2002, pages 597-612, Heidelberg et al., 2002. Springer. [Klas et al. 2004] Claus-Peter Klas, Norbert Fuhr and André Schaefer. Evaluating Strategic Support for Information Access in the DAFFODIL System. In Research and Advanced Technology for Digital Libraries. 8th European Conference, ECDL 2004, (to appear), 2004. Springer.